Are we becoming thinkers working on auto pilot that we do not question our abilities to think? Aristotle describes this impulse as humanity’s “Desire to know,”. These basic stipulations are that mimesis is fundamental to our nature as human beings, that human beings are the most imitative of all creatures, that first learning experiences take place through mimesis, and that all human beings take pleasure in mimesis because all find “learning and inference” essentially pleasant. Since the focus of the Poetics is mainly on literary mimesis, it is necessary for us to concentrate on Aristotle’s understanding of the way this aspect of mimetic activity leads to the intellectual pleasure he assigns to art. Aristotle refers to “The aim of art is to represent not the outward experience, but the inner significance”, When I think of inner significance three things come to mind, imagination, individuality and originality. Since each of our life experiences are different our imaginations should be distinctly different and our perception can vary significantly based on our learning and determination to risk failure to learn. Our originality in my thoughts is a result of how we reflect our imagining from within through our habitual creative practice to present the imagined into a work of art.A learning process such as this is never ending as long as we desire to create and every time we create a work of art from our imagining we risk the out come but the more we risk the more we learn and the more our work evolves. The creative lounge, the theme exhibitions and our interaction with one another are all part of the learning experience as is the our attitude towards the simplest and most menial tasks as these things are all part of who we are. YOU ARE VERY CORRECT ,MY FRIEND ! BUT WHAT I FEEL IS … “LEARNING” MEANS ..” LEARNING THE WORLD TO KNOW YOUR SELF ” AND ” LEARNING YOUR SELF TO KNOW THE WORLD ” THAT IS THE CONSTANT PRACTICE …OF LIFE TO MAKE YOURSELF A PERFECT HUMAN BEING ….THEN WE CAN THINK OF CREATIVITY …A PERFECT HUMAN BEING (EGO LESS) CAN GO CLOSE TO”GOD”…THEN WE CAN THINK OF CREATE SOME THING ..”GREAT”…..
Edgar when we are talking about The Great Thinkers in our conversation How can we leave out The Philosophy of Socrates and his famous quotes to us all. Are these discussions not an example of the Socratic method, a process of learning amongst those engaged in this process, of questions and answers not specifically directed at defining absolutes but postulating possibilities to further discovery and enrich the personal journey? I’m a linocut – and you? I’m only a linocut – and you? Well if you’re a linocut than I’m an unfinished sculpture. Hopefully by the day I die I’ll have finished sculpting myselI don’t know much about these guys, Socrates & Aristotle but I really like the quote you gave from Socrates “I know that I know nothing” that certainly applies to me. I will never know enough, on the day I return to the Universe my poor brain will be mostly empty. I need many lives, each time remembering the one before in order to fill my brain to capacity. 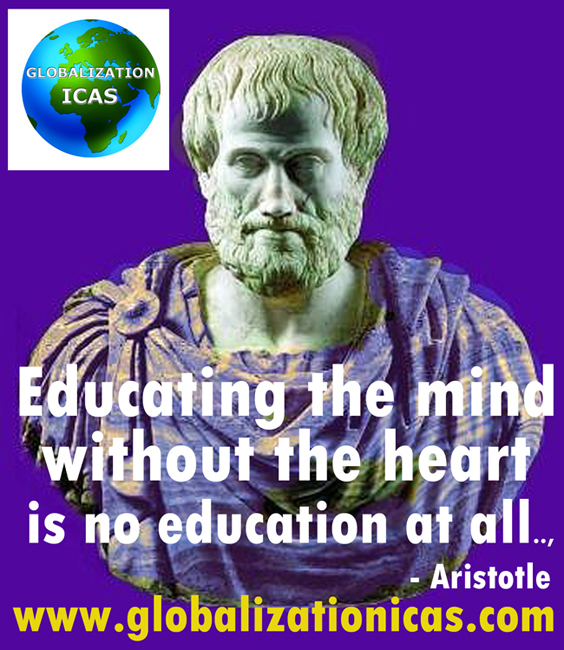 Aristotle I love, because you tell me “he floated mentally 5 inches above the ground.” I’d love to have that kind of brain: so full and knowing even though all that knowledge could at time produce such aching saddness. So I accept them both as Great Men who helped to shape our world. My favorite poem is “The Lovesong of J. Alfred Prufrock”, I guess that says something about me. Hello Ruth, I am as perceived by others at a given moment in time subject to change from the effect of a continuing process of learning and meditation. Tell the Joker through meditation he can get higher than 5 inches. He may even have an out of body experience and present us with a linocut rendition of Chagall. Hello Ruth, yes I believe very strongly in fairness. With equality I would have to add opportunity. I think a lot about the natural world and find there is no equality in nature but nature provides unlimited opportunity and so in regard to equal opportunity I believe any human anywhere in the world should have the same opportunities to be free, to be happy, to nourish and shelter their families and to pursue their dreams and my sense of fairness would add that those less able should be given the opportunity for assistance so their lives have as much meaning as the most able. I believe there is honour in doing our best regardless of our profession and there is honour in helping others do their best. Edgar – And yet Aristotle is also credited to have said,” The aim of art is to represent not the outward appearance, but the inward significance”. To me this implies the individual experience of the artist creating for his or herself which affirms some of your response. In a sense philosophy is like faith. it stimulates beliefs and imaginings that affect our changing perspective of the realities of our lives and affirms the cause and effect of volition without which this would be a gray world for me. Ja Peter, ich akzeptiere Aristo (ein Kurzbegriff hiesiger Philo-Studenten) auch, dass er die ganz Kunst-Familie damit auf einen Nenner bringt … ich stellte nur die Frage, wie sein Lehrsatz gelautet hätte, wenn die Malerei damals bereits den Stellenwert von 2013 gehabt hätte … und ich frage, hätten Rembrandt und Picasso dann anders gemalt … und wir auch … wie würde ein linocut aussehen oder eine Altmeistertechnik? … natürlich ernennen sich selbst viele Philosophen zu Religionsstiftern und sind das in einzelnen Fälle ein wenig … sie sind schließlich sogar die Väter der modernen Mathematik … aber meistens leben sie in einem alten Fass … meine Abschlußfrage für heute: Wie würden wir ohne Philosophen sein? Könnten wir dann überhaupt leben? Yes Peter, I accept Aristo (a short-term Philo of local students) and that he thus brings the whole family of art to a common denominator art … I asked only the question of how his theorem would have read if the painting had then already had the value of 2013 … and I ask, Rembrandt and Picasso would have then painted different … and we also … would look like a linocut or a old master technology? … of course appoint themselves to many philosophers and religious founders are in some cases a little … they are, after all, even the fathers of modern mathematics … but mostly they live in an old barrel … my final question for today: How would we be without philosophers? Could we live at all? Edgar, who can know how Rembrandt and Picasso would have painted but we can agree their talent would still have produced the quality we attribute to them. To me you are a philosopher in hiding as we all are in our reflections of being until others put value to our thoughts. Without philosophy we would live in the world of animals subsisting from nature as they do. We would have no concept of beauty, no art, no music, no literature etc. Our lives would revolve around a value system that rewards the creation of functional objects that would enhance a material existence totally lacking in faith, beauty and regard for those who do not or are unable to contribute to material accumulation. It would be a world of instinctual behaviour totally lacking in intuition. It would preclude any concepts of democracy or freedom in favour of survival of the fittest or strongest. Hi Peter I only wish I could express myself as well as you. Everything you have written to me is how I believe and feel. From the time I was in Kindergarten I felt strongly about helping those less fortunate. Once when I was about 7 yrs. I kept loading my little red wagon up with my toys & walked to a poor neighbourhood & give out my toys. I did this until nothing was left put the little red wagon…which I than gave away. I am still this person. I totally agree with you about the natural world. But we have minds to think with & to understand beyond the natural world. So I am 100% in sync with you that “any human anywhere in the world should have the same opportunities to be free, to be happy, to nourish and shelter their families and to pursue their dreams”. Since I have MS a disability, with to date no cure, I am in total agreement with your statement to me: “my sense of fairness would add that those less able should be given the opportunity for assistance so their lives have as much meaning as the most able”. In fact, I believed this way from childhood because my parents taught us to feel for those who had less. Peter It seems to me that we are very similar in our outlook on life. I feel like you do about religion & politics, about fairness, etc. I just can’t express myself as well as you do. When you write all your words are so beautiful, your thoughts so clear. You have a way of expressing yourself that most of us lack & it’s always a pleasure for me to read everything you have to say. Wow Peter your final answer to Edgar’s questions is so wonderful, enlightening and beautiful that I will be thinking about it all day. I don’t see how we can put Rembrandt & Picasso in the same bucket. Rembrandt lived in a very different time period when paintings were done for the church or rich merchants & that determined the style & subject matter. Picasso lived in a more open time period when artists were getting together talking, exchanging ideas & experimenting. Picasso kept exploring & pushing the envelope his entire life. To go to the Picasso Museum in Paris is a treat as you experience all of his time periods. He was one of the leaders of innovation in art and constantly changed his style of painting, always exploring something new. If Rembrandt were alive today I believe he would be world famous, have a great style & would be on the leading edge of experimentation. He would be leader in the Art World. Picasso would have painted in his every changing style if he were still alive today. Both are two of my favorite artists for very different reasons. Rembrandt would have gone w bild in this open age where he was free to paint with no constraints. He would have been known world wide & been a leader in thinking way outside the box. Perhaps their spirits are living in all of us! I look forward to how our Wonderful Peter will answer your questions & make more sense out of my answer. Peter is the most wonderful of any in his use of the written English word. Good evening as it is here in the UK welcome to all our founder members enjoying deep conversation on Aristotelian theory and also bring both Picasso and Rembrandt as two great masters during their times and still continue for their contribution today We can draw interesting parallels also as they all left behind higher standard of works and achievement that was accomplished during their time..
Hello Edgar, Perhaps your answer is in the picture of Aristotle’s wife. We have to release the ball and chain to get to a level where we look at what has come before us and create our own ” Venus Rising”, with the understanding that philosophy can inspire art. Edgar & Peter I think that artist’s have already thrown off the ball & chain. We don’t like to conform, we don’t like to be chained down, we want to be able to fly, to seek out new ideas, to paint in any way/direction we feel like taking. I do believe what Peter has said that “philosophy can inspire art”. But that only happens once we have the courage to release the ball & chain. I have always been a non-conformist if my parents or a teacher tried to punish me I would turn it into a game. My point is this: We have control, we can unchain ourselves any time we want to so we can fly. If we remain chained it is because we want to be controlled. I, for one, can’t stand to be controlled & would rather fly free & take my chances of falling then be chained to the ground. Hello Edgar, perhaps the chairman is feeding your doubts, Let me assure you your work is original and has value to people who see art objectively and do not, like your chairman, approach art from a subjective point of view which he then protects with exclusivity by putting your work in a drawer. I would cordially thank him for his opinion and say aufwiedersen. As to Aristotle’s wife, why would she want to carry the ball and chain when they are mere symbols or possessions weighing her down? To retain an old concept that you have determined to be lacking with a new concept would be a contradiction resulting in indecision that retards progression. The ball and chain are a contradiction to her freedom to rise to greater heights. Aristotle is also credited to have said,” The aim of art is to represent not the outward appearance, but the inward significance”. We could relate this to also apply the thought that art has a deep enriching effect echoed both inward using our five senses of sight, hear, touch, taste smell, that fellows an outwards appreciation through its surroundings. Another area we could cover here is that of meditation practises that we enjoy regularly taking an inwards experience into the mind. Scientific research had confirmed regular experienced mediators’ normally reach the base level were all thoughts resonate. All this potentially begins to open our minds to source of knowledge with endless possibilities. We open the platform to add your thoughts to this or any other points you would like to join us in our conversation to add.., Have a pleasant Sunday! “I see art, feel art, hear art, taste art because my whole being becomes art”. Art of sculpting – touch, feel, movment, sight. All knowledge is available to us as we need it. How often do we awaken in the morning with a solution to a problem, answer to a question or insight to a piece we are creating. Meditation is similar to the state of mind we experience when we are transitioning from consciousness to sleep. A zone of relaxation and awareness unencumbered by distractions and streams of thoughts. This zone or meditative experience is our access to knowing and creating on an individual and collective level. We all experience this zone when we direct our concentration to a specific thought or act. Through meditation this state of mind can be achieved at will and I would like to suggest that you try meditation everyday prior to beginning your work, clearing your mind of distractions, and at the end of the day before you sleep. Hello Ruth, generally I pick a quiet place either on the patio or in the studio for my meditations. The process is similar to hypnosis regarding releasing from the reality of activities and thoughts that deter concentration. A reclined relaxed position with calming thoughts of a natural setting that may be pleasing to you such as sitting by a stream, watching a sunset or thinking of descending a set of 10 or so stairs into cool quiet comfortable place with no distractions, releasing current thoughts with each step you descend and reaching deeper and deeper into a zone of peace and tranquillity becoming one with the creative flow within you. Don’t worry about falling asleep as you will waken refreshed and inspired. At times I have in the past also used meditative music or chant, ( I like Gregorian chant,) at very low volume as a preliminary means of relaxation. I also use meditation as a healing process allowing myself to feel the creative energy to regenerate my physical and spiritual being to the perfection of creation and knowing that I am part of this perfection. I believe this can also be used to help others with their afflictions as we are all connected. And not forgetting Antonino – Art of colour wood lays – sight, touch, & hear. Hallo Edgar, Meditation is a term, It describes a frame of mind common among all people, a frame of mind you yourself experience every time you are engaged I a level of concentration where your awareness of time is irrelevant and the act of doing is so automatic it is subconscious and you are barely aware of the act of doing. I’m sure this is something you experience quite often when you are creating a work of art. It is part of the process of reaching within, it is a zone of being that lies between conscious awareness and subconscious knowing, The practice of meditation allows us to enter this zone of awareness at will as we practice achieving this relaxed state. Meditation has been used in all cultures since the beginning of humankind. The is the link between physical existence and the awareness of or faith in the creative power we attribute to our existence. The term meditation is but a word, a tool of communication describing a thought process. Thank you Sunil, for a time I read many biographies and found your parallel so common in the lives of notable writers, artists, scientists, philosophers, theologians, etc, and Jesus Christ is said to have spent forty days and nights in one meditation. 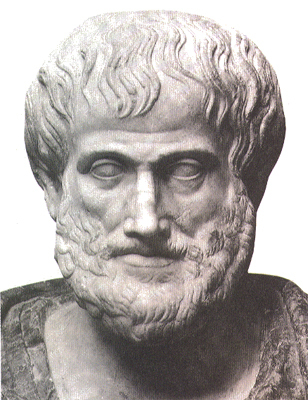 Aristotle’s theory was as artists a trade to our skills as greater observers of Life we therefore better equipped to capture what we see and experienced to be transferred into our work. The more we observed Life through our other senses the more details and information we are able to reflect in our work. We acknowledge the role of all the great old masters with their life long achievements today still inspires all the modern generation of artists. We continue further to draw onto parallel observation and provide examples on his statement ” The aim of art is to represent not the outward appearance, but the inward significance”. 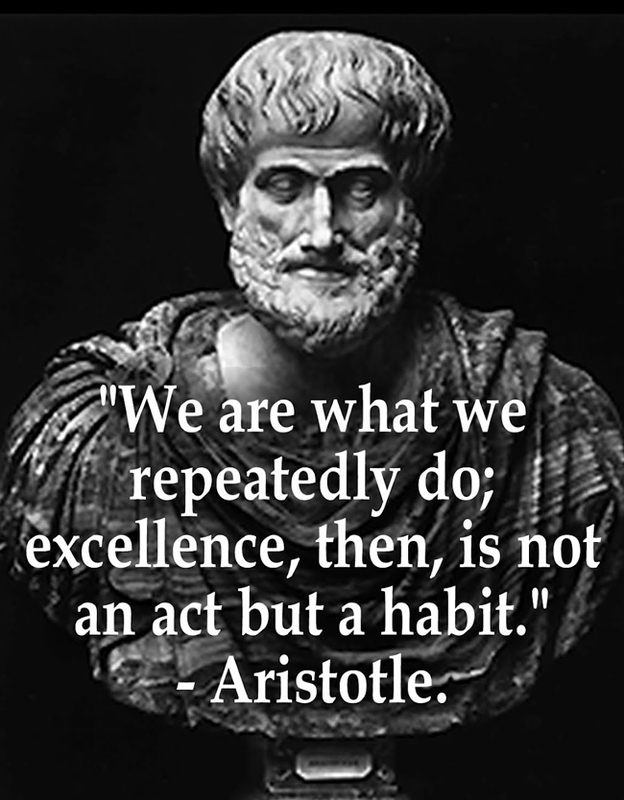 Aristotle’s theory of what art is applies as much today as ever. What has changed is, since the advent of the camera and methods of printing the role of the professional artist has changed. until the photographic image was conceived all modes of printing relied on professional artists to create images using techniques such as woodcuts, linocuts and etchings and many of these artist also produced fine art in portraiture, landscapes and figurative art and the Aristotelian aesthetic influenced distinct styles. Now we are in a world where there are those that feel the word professional no longer applies as there are fewer artists that actually make a living from their work and those that do make a living from their work have expanded the meaning of art to where we are is in a state of flux as to the definition of art. This becomes a difficult task as we continue to expand concepts and mediums of expression. When I apply Aristotle’s theory to this modernity of expression it becomes easier for me to separate what is from what is not. As we bring ourselves to present day into the 21st century and look forward into the future we are face with another dilemma the changing period of modern computer imaging (digital Art)? In 2005 I applied all that I had studied and learned from my great Educators and started all over with my left hand or my “Lesser Hand”. I have worked almost exclusively with my left hand since…I did this to reach higher levels of creativity and I have yet to have my creative block return. I would suggest the same for any artist who has truly mastered his dominate hand. There is nothing like feeling like a child while having the mind set of a master. Terrence~ That made me laugh thinking about you trying to sculpt with your lesser hand… yes not a wise choice early on. Using the lesser hand has been taught over and over again but not all students continue with the daily practice…I became addicted to the stark difference between the two hands…My primary goal is to have a creative idea and not have to think about which hand picks up the pen to translate it to paper. Sunil~ Brain Gems is a great book on the subject. Good afternoon to all our GICAS members welcome to our Creative Lounge, Rosalind thank you for bringing one of our greatest topic we introduce as an organisation to cover. THe coversation around Aristotles theory on ART? What are your views on the questions? All are welcome to make their own observations. It would be wonderful to leave the question open for months of August and if possible September. thank you very much Sunil I’ll dig this topic with great interest. wow !! what a wonderful inspiring read and insight into the world of philosophy…following on from Sunil.s last quote about spending time thinking. I spend a lot of time sitting in fromt of my paintings, contemplating and re-connecting with my it, before I start work on it each time. Once ready and with brush in hand , i am then connected and part of the painting again. Funny but I need this meditative time each day to fully engage and immerse myself into the possible narratives of the figures i paint. Lesley welcome to our creative lounge these opportunities and practices are very valuable and to be encourage more.., bringing John Lennon one of my favourite Beatles wrote all his famous songs sitting down to meditate he describe the moment as endless pool of ideas and flashes of brilliance to his words for many of his famous songs!!! all these comments are very interesting !! Creative people grasp the value of a clear and focused mind – because their work depends. Many artists, entrepreneurs, writers and other creators, such as David Lynch, turned to meditation to access their most creative state of mind.